From her teeny-tiny house in a teeny-tiny village, the little woman sets out for a small stroll. It's autumn, and the chilly winds are loosening the last leaves from the trees as she opens the filigreed gate in an iron fence around a quaint old churchyard. And there, on one tiny grave, there lies... a teeny-tiny bone. Should she pick up that bone? Should she take it home in her teeny-tiny pocket? So, in the best tradition of such stories, of course she does. "THIS TEENY-TINY BONE WILL MAKE ME SOME TEENY-TINY SOUP FOR MY TEENY-TINY SUPPER." SHE SAID TO HER TEENY-TINY SELF. Does the little woman jump up and return the teeny-tiny bone to its proper teeny-tiny resting place? What? You want a spoiler? Suffice it to say, this old English folktale is one of a venerable genre known as the "jump tale," in which the reader or storyteller shouts a surprising something that makes the listeners startle or jump in their seats. 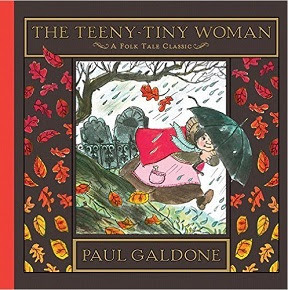 This brand-new edition of Paul Galdone's beloved The Teeny-Tiny Woman (Folk Tale Classics) (Houghton Mifflin Harcourt, 2016), is perfect fare for pre-Halloween storytimes for first-graders, especally if they are already familiar with Jill Bennett's and Caldecott artist Tomie de Paola's simpler and charming preschool classic, Teeny Tiny (Puffin Books) and followed up by Joanna and Paul Galdone's homespun all-American version, The Tailypo: A Ghost Story (Paul Galdone Classics) (Houghton Mifflin Harcourt). These are delightfully slightly scary stories meant to be performed with gusto, with just the right ambiance in their illustrative atmosphere to hold a few kids or a crowd open-mouthed as the suspense builds to the final page-turning climax. For a class these stories are great for asking the kids "Why is this called a "jump" tale" and "What is alike and what is different in these stories?" Savvy readers (or ones with older siblings) may even recognize the, er, bare bones of these stories as forms of the more frightful fireside summer camp staple, "The Golden Arm" or the oft-assigned literary horror story, Edgar Allan Poe's The Monkey's Paw.